i dont have alot of money in my lg and im going to fight the elite four i need help to know how to make money but i want to know what was hardest for you when you faced the elite four and why. i cant beat my rival because his blastoise keeps using hydro pump and i die. Last edited by Gamingproboy12 on Tue Nov 18, 2008 1:37 pm, edited 1 time in total. If you have an amulet coin, attach it to one of your Pokemon, and you'll get double prize money after a battle. And you can also invest in a Meowth, teach it Payday, use Vs. Seeker on Rich People (Gentlemen, Solicite, ect.) and you'll get double their money + the money you pick up from Payday! And the hardest during the Elite Four was always the first fight, the Ice battle. The best solution to making fast money is to go to Five Island, and Surf up to Resort Gorgeous and use the Vs Seeker with the trainers there and fight them with the Amulet Coin. He hasn't beaten the elite four yet. And I like Kreuggikarp's theory. I works extremely well for D/P too. After Exp-share-leveling my Dark team (which was a huge failure) I was able to buy all of my EV-leveling items at the Dept. Store. Which was fantastic 'cause I'm too lazy to get EVs to hard way. 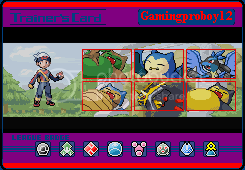 i cant beat my rival because his blastoise keeps using hydro pump and i die. You need a good grass type. well i never caught one so where can i catch a high or decent level water or grass type? The highest level grass type you can get at that point (I think) are Weepinbell in Berry Forest. It will probably be under 40 though. Or if you go with water, Tentacruel or Slowbro would be decent to wall the Blastoise water attacks. Lapras would be my first suggestion, but it requires the most leveling.